In the late 1800’s, “Decoration Day” was established to commemorate those soldiers who had given their lives during the Civil War. The name derives from flowers and other decorative items that were placed on the gravesites. As we moved into the 20th Century, May 30th was set aside to memorialize all service men and women who had died while in the armed forces and Memorial Day was adopted as a National Holiday. This day has continued to evolve and today it serves as a remembrance of all those loved ones who have passed on. Celebrated on the last Monday of May, it also serves as the unofficial start of the summer season and is best known for parades, fireworks and, of course, barbecues. There are many religions and cultures who believe that when we pass on from this life we move into the “Summerland”, a place of endless beauty and peace. It is interesting that, perhaps subconsciously, we have adopted a day where we remember those we have lost while at the same time welcoming the summer season. Throughout its many evolutions, Memorial Day has always been a time to enjoy food and activities with our family and friends. Maybe the intent of this day was always about finding the joy in each of our lives – even while we mourn our losses. Here are a few suggestions on how to use crystals to honor someone with your own “Decoration Day” tradition. Decoration means “to beautify or embellish” and crystals are one of nature’s most beautiful decorations. The perfect crystal will remind you of the happy times while at the same time helping to you heal from your loss. ALTAR: Creating an altar is a traditional and practical way to remember your loved one. Be sure to find a quiet place and insure that the focus of the space will be respected. Include items that remind you of your loved one – photos, flowers, statues or knick-knacks, candles, and even jewelry. Just be sure that the items you choose remind you of joyful times and how that person lived their life. You want this altar to celebrate their life more than a reminder that they are gone. Amber has a very strong life-affirming energy that will be a very positive addition to your memorial. It is a powerful healer and will enable you to manifest the happiest of thoughts and memories. 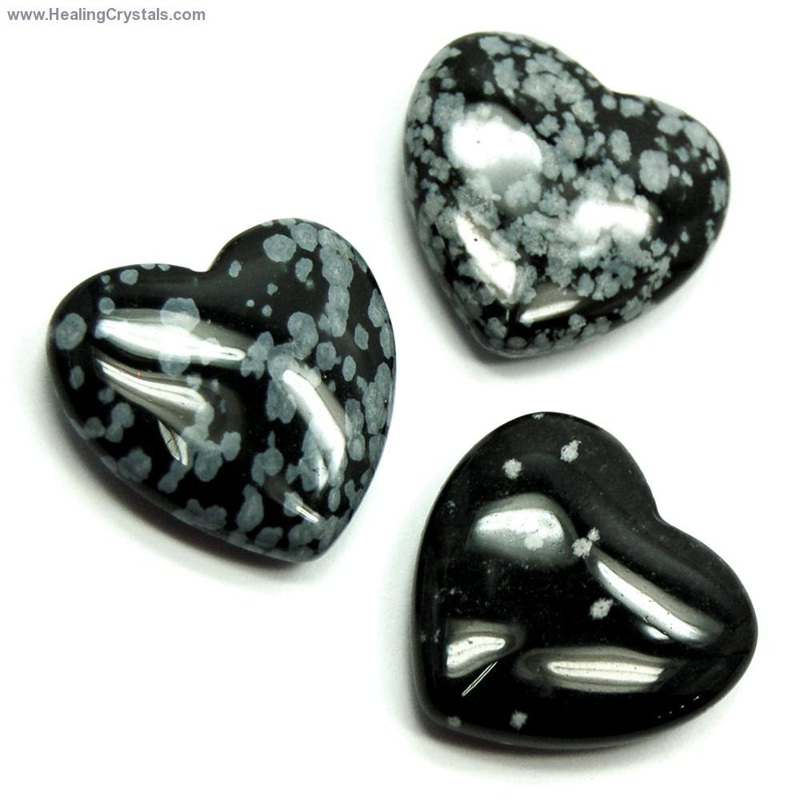 Snowflake Obsidian is a very calming & supportive crystal that is particularly helpful when you are grieving. Its very appearance of black and white reminds us that there is a balance to life and that while it is okay to feel sad, it is just as important to remember how to be happy. CEMETERY: While visiting a cemetery or final resting place of your loved one, a Rhodochrosite will offer comfort and compassion and remind you of the love that you shared. It will help to release any old, damaging emotions and enable you to move on in a positive light. Aqua Aura is a natural attractor for positive energy and promotes communications at all levels. You might want to leave a small Aqua Aura by the site to add beauty and enhance the energy of the area. TAKE A TRIP: This is my favorite way to remember a loved one. My Mom passed away several years ago and recently we remembered her by going to one of her favorite places. It not only reminded me of the love and fun that we shared but also helped me to share the kind of person that she was with my son. It was a positive, life-affirming activity that left me smiling at the end of the day. I think that is how all of us really want to be remembered. So go out and have some fun! Go to the beach or the park or wherever you will have the best possible memories of the times that you shared with those that have passed. Carnelian is a powerful stone for really feeling the life that is all around you. It increases your personal power and physical energy while reminding you it’s great to be alive. Amethyst will enhance your spirituality and help you to see the higher beauty and purpose in all things.